Excellent post Anaconda. I wonder though if we might be able to do away with the heat and pressure model totally? What if, when the earth is under the increased stress of what EUers believe are periodic 'storms', that the oil isn't created rapidly and profusely, with slower but steady production in calmer periods? Heck, with enough production, maybe you could hydraulically expand the earth? Woops...straying into NIAMI here! Excellent post Anaconda. I wonder though if we might be able to do away with the heat and pressure model totally? What if, when the earth is under the increased stress of what EUers believe are periodic 'storms', that the oil isn't created rapidly and profusely, with slower but steady production in calmer periods? I wonder though if we might be able to do away with the heat and pressure model totally? Yes, it would seem a possiblity that the more electromagnetic energy, the less pressure and heat required for abiotic hydrocarbon formation, but "to do away with the heat and pressure model totally?" I'm not so sure about that. Hydrogen and carbon have a chemical affinity for each other because of their respective chemical structures, true enough, and hydrogen is the most common element in the Universe and carbon is the sixth most common element in the Universe, but with low heat and pressure, electrical energy might even do the opposite much like electrolysis will seperate H2O into hydrogen and oxygen. Also, the physical evidence, i.e., where oil deposits are located, both in deep deposits and above deep faults in the Earth supports the requirement of heat and pressure (oil is found above relatively minor faults as well, but the deposits tend to be corespondently smaller). Kudryavtsev's Rule states that any region in which hydrocarbons are found at one level will also have hydrocarbons in large or small quantities at all levels down to and into the basement rock...He gave many examples of substantial and sometimes commercial quantities of petroleum being found in crystalline or metamorphic basements, or in sediments directly overlying those. He cited cases in Kansas, California, western Venezuela and Morocco. He also pointed out that oil pools in sedimentary strata are often related to fractures in the basement directly below. This is evidenced by the Ghawar supergiant oil field (Saudi Arabia); the Panhandle Field in Kansas (United States), which also produces helium; the Tengiz Field (Kazakhstan); the White Tiger Field (Vietnam); and innumerable others. This observation has largely been confirmed by subsequent investigation. What if, when the earth is under the increased stress of what EUers believe are periodic 'storms', that the oil isn't created rapidly and profusely, with slower but steady production in calmer periods? He [Kudryavtsev] noted as mentioned above that the enormous quantities of hydrocarbons in the Athabasca tar sands in Canada would have required vast amounts of source rocks for their generation in the conventional discussion, when in fact no source rocks have been found. Likely, vast amounts of oil spread out over the land mass and either started out as heated heavy oil or just as likely the more volatile portions of the oil evaporated over time, possibly this flow was assisted by an electromagnetic influence which caused the oil to flow more readily, as mentioned in the previous comment. However, the oil and tar sand deposits are astounding giants in comparison. The Orinoco heavy oil belt in Venezuela and the Canadian oil sands of the Athabascan deposits both contain estimates of over 1000 billion barrels of oil each. These are deposits of heavy oil completely intermixed with sands over thousands of square miles. There is no way that this extremely vast amount of heavy viscous--flowing only when heated--hydrocarbon material could have formed, "migrated", and become completely intermixed, into the present sand beds from any "fossil" deposit. I enter this thread with some lay-person observations as I have limited understanding of the science being discussed here. Nonetheless I'm asking if there may be some connection between the superconductivity of metals and rocks and the formation of metal deposits in dentric veins (caused by electrical activity?) below the earths surface. I imagine a lightning bolt traveling through earth crust causing the cracks/veins and then nature responds by forming a lubricant such as hydrocarbon to accommodate these openings or at other times precious metals fill these cracks/veins. So is there a connection between the original causal electrical activity and the phase changes in minerals and metals to travel and act as superconducters in these regions. ermmmm I hope this make sense? "So is there a connection between the original causal electrical activity and the phase changes in minerals and metals to travel and act as superconducters in these regions." Maybe not superconductors, but at least conductors of less impedance than the surrounding rocks? Ana suggested that you couldn't do away with the temperature and the pressure for the creation of these raw hydrocarbons, but- what if these hydrocarbons begin their lives in a z-pinch in the prerequisite rock strata? There is enough temperature and pressure in a z-pinch of adequate current to create geodes with quartz crystals inside, right? Ohh yeah- and they found those geodes with petroleum oil inside them, too! Holy Blue Hellz, Batman- what if the Earth IS a giant geode, and it's not filled with crystals or empty space... but with OIL?? Joking aside- is it possible that hydrocarbons could be created in sustained z-pinches, possibly in zones of strong telluric current? I suppose that we like to consider 'telluric currents' as currents travelling horizontal (as we do) around the surface... but what of currents travelling from closer to the core of the planet outward/upward? I'm sure there have got to be some pretty strongs ones moving through those regions, and are probably sustained indefinitely (think Earth's magnetic field as electromagnetic vs. ferromagnetic). Could subterranean currents of vast power create hydrocarbons in deep formations all by themselves in this way? Holy Long John Silver, Batman!You may be on to something here! The Earth might be like a gigantic coconut ready to crack. But first there is recent research in high temperature superconductors showing that the vibrational changes in crystalline lattice structures start to cause change in conductivity of material from semiconductor to superconductor. I like the idea of z-pinch currents travelling up wards from centre vicinity to edge. This might be evident if we could view the behaviour of lightning when it strikes earth. We can ask what is happening underground when this happens? The thing is tho, Tina- 'superconductive' implies no loss, right? No loss means no heat from the current passing through the conductorive material. If we don't have heat, we'd have nothing but current and pressure, and that wouldn't satisfy the criteria Anaconda set for the formation of this stuff. Very interesting all by itself, tho- high temp superconductivity! Probably deserves a thread to itself! Oh, and that link to the slow motion video of the lightning bolt- that was amazing! The charge snaked out of the sky towards the ground on a dozen different paths, then one of them made a circuit to the ground- Bam! - energizes, all the other little feelers disappeared (presumably back up into the cloud then back down the new connection channel) then the full equalization of charges too place. All the little feelers heading towards the ground initially reminded me of dendridic channels on a solid surface (like around some of the martian craters and whatnot). I've never had the opportunity to see lightning slowed down like that before and make that observation- I wonder if they are similar circumstances, regarding the physics of the events? 1) Lightning causes dentric veins beneath earth surface just as seen on land. 2) Heat energy from lightning causes formation of the necessary materials that now must occupy newly formed veins/cavaties etc. Re: Video . I'm a slow-mo lightning junkie and I love watching these videos on Youtube. What I've observed is that the lightning sends out dentric feelers to search for ground. The first feeler to find ground instantaneously causes any other feelers to retract/dissipate into the earthed bolt. There is something going on here to do with with quantum entanglement (or quorum sensing as in biology) because there is certainly communication between dentric feelers. I do follow your line of thought, Tina- regarding the creation of veins of metals/minerals within substrates by electrical currents. What I was focusing on rather, was more along the lines of: If electricity creates hydrocarbons... how do you create an oil field? Regarding the lightning- imagine you have a balloon that is filled to overpressure against the surrounding atmosphere. The air in it wants to escape, but it has no means to. Now imagine that you take a dozen needles and slowly start pushing them against the balloon. The very first hole made by the needle that first gets through is going to be the point at which ALL of the air in the balloon is going to escape through. The air that was pushing against needle #6 isn't going to keep pushing at that point- it is going to follow all the rest of the air out of the hole that is already made. A rough analogy, but sort of functional in this case. Electricity always takes the 'shortest path to ground'... or in other words- 'equalization of charges.' All of the charge in the electrical field in question (the balloon) is going to go through the first hole it finds (path to ground or equalization against the neighboring charge field). Hans Alfven was quoted as talking about a problem he saw when he was working as an electrical engineer. They had problems with some busbars (like a circuit breaker) blowing at their sub-stations. When these busbars blew, ALL of the current contained in the electrical wire for several miles jumped across that arc gap instantly! The total charge contained in that wire immediately went 'out the first hole it found'. This was the example he used to explain what happens in a 'supernova' from the EU perspective, in fact! In regards to the idea of Z-pinches, I have no reason to think that can't happen and could contribute to increased pressure, but it would also contribute to temperature as well. Because the pinch effect increases resistence to the electrical flow which generates heat. I suspect that the economic minerals as well as oil are formed fairly deep in the crust or shallow mantel and heat and pressure cause them to rise up in the crust (oil rises also because its density is less than the surrounding rock strata). And per previous comments, I certainly think electromagnetic forces could contribute to the upward flow of these minerals. Chevron Corp. said Friday it has made a "significant" oil discovery in Angola's offshore waters, underscoring the West African nation's growing significance to Chevron and the country's rising stature as an energy producer as neighboring Nigeria copes with militant attacks. A Chevron spokesman declined to estimate how much oil and natural gas the discovery might hold, but it comes as the San Ramon, Calif.-based company is set to start pumping crude in coming days from a separate, $3.8 billion project also in Angola's offshore waters. The recent find, based on a single discovery well, still needs further drilling to be confirmed, Chevron said. Oil discoveries pegged as "significant" by major oil companies such as Chevron often imply crude and gas resources of at least 500 million barrels. Chevron's latest find marks the latest in a flurry of discoveries off Angola in the past few years that have made it Africa's biggest oil producer, with output of around 1.85 million barrels a day in July. This in addition to offshore Nigeria, and, now, Namibia (formerly South-West Africa). Many of these finds are in ultra-deep waters and are subsalt (below the salt layer) in ultra-deep geological strata. The oil finds interestingly enough are parallel to the finds off the coast of Brazil. Dozens of fruitful wells beneath the rich Bakken shale in North Dakota continue to fuel a hunch among oilmen and geologists that another vast crude-bearing formation may be buried in the state's vast oil patch. Lynn Helms, director of the state Department of Mineral Resources, said recent production results from 103 newly tapped wells in the Three Forks-Sanish formation show many that are "as good or better" than some in the Bakken, which lies two miles under the surface in western North Dakota and holds billions of barrels of oil...The Three Forks-Sanish formation is made up of sand and porous rock directly below the Bakken shale. But geologists don't know whether the Three Forks-Sanish is a separate oil-producing formation or if it catches oil that flows from the Bakken shale above. This hypothesis seems to be confirmed by discovery of oil in the Three Forks-Sanish formation. Likely, upon scientific analysis, it will be found that the oil has the same chemical signature as the Bakken oil formation. And opposed to the suggestion in the linked article that it is possible that the oil flowed down to Three Forks-Sanish formation from the Bakken formation, rather, it's likely the oil flowed UP from the Three Forks-Sanish into the Bakken. This post on hydrocarbons in the deep Earth has also raised the issue of Earth's electrical conductivity in relation to hydrocarbon formation. It seems that there are "many roads which lead to Rome" and all have signs with electromagnetism written on them. ZUG, SWITZERLAND—Transocean Ltd. (NYSE: RIG) today announced that its ultra-deepwater semisubmersible rig Deepwater Horizon recently drilled the deepest oil and gas well ever while working for BP and its co-owners on the Tiber well in the U.S. Gulf of Mexico. Working with BP, the Transocean crews on the Deepwater Horizon drilled the well to 35,050 vertical depth and 35,055 feet measured depth (MD), or more than six miles, while operating in 4,130 feet of water. Fossils have only been found as deep as 18,000 feet deep. With that kind of water-depth capability and with advancement in technology likely increases in that water-depth capability, most of the world's sea floors are open to oil exploration & production. In this thread I have discussed at length the sub-salt ultra-deep water, ultra-deep drilling oil off the coast of Brazil and the reasons this is evidence of Abiotic oil theory. But a reasonable reader could say, "Sure, that all sounds good and all, but what do the oil geologists who found the oil in the first place say about the origins of the oil in question." "According to Guilherme Estrella, Petrobras E&P director, the lake that formed during the beginning of the separation of the continents some 120 million years ago allowed the deposition of source rocks (Lagoa Feia formation) that originated the reserves now starting to be produced in the southern Atlantic Ocean." "As a result of research about the formation of the South American and African continents by Petrobras geologists, more than $1.5 billion was invested by Petrobras in the past couple of years to drill 15 wells that reached the pre-salt formation with 100% success in finding oil." There is a problem with this explanation: Any self-respecting oil geologist or general geologist, for that matter, knows that a shallow lake did not and could not form where he claims one did form. The pre-salt layers are at least 16,000 feet below the current sea level, no geologist with a straight face will tell you that a lake would form 16,000 feet below the current sea-level. All the geological evidence points to much higher sea levels in the geological record 120 million years ago (if the oil is even near that old) with fossils of fish and shell fish being found ON the continents and North America being partially covered in shallow seas at the time the continents came apart. So, the idea that an inland sea covering North America simultaneously with a "shallow lake" 16,000 feet below the present sea bed off the coast of Brazil seems quite unlikely. The salt layers as Mr. Estrella well knows are not the product of evaporation (a child's myth), but are the product of supercritical water deposition. The depth of the salt layers is clearly deeper than where evaporation ever took place. So, the evidence is clear that the ocean levels, whatever their causation were never low enough to produce "shallow lakes" 16,000 feet below the current sea bed. 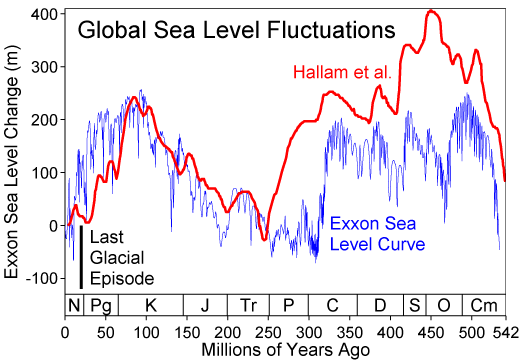 On the contrary, the evidence is that sea levels were much higher than they are today. Conclusion: The explanation provided by Guilherme Estrella is not credible. But why an explanation that isn't credible to anybody that knows the geological evidence? Simple: The only other explanation that makes sense is that oil is abiotic, but that's not what the oil industry wants to talk about. Anaconda wrote: The pre-salt layers are at least 16,000 feet below the current sea level, no geologist with a straight face will tell you that a lake would form 16,000 feet below the current sea-level. A lake would not form at such a depth, but the bottom of the lake can continuously subside. Some Rifting lakes like lake Baikal are deep (5400 ft) while others like lake Victoria are not so deep (280 ft), but the bottom can gradually subside to great depths, for example, down to 10,000 feet for the Rhine graben that is filled with sediments and which surface is not below sea level. So that is not a so good argument. Yes, I grant you that lake bottoms can subside, as you point out. The Western Interior Seaway which was mentioned earlier, is also called the Cretaceous Seaway, forming a sea that rose and fell over the course of the Cretaceous Period. The sea at its deepest was roughly 2,700 feet deep, shallow as seas go, but gives the reader an idea of how much higher the sea level was in this period. The "fossil" theory of oil origin claims that organic detritus precipitates in shallow, and I might add, stagnant lakes, but here the evidence is that it would not be a lake but an emerging oceanic basin likely with strong currents. The scientific evidence suggests that the rifting of the continents apart from each other created the oceanic basins into which the sea water flowed, thus drawing off the water from the mid-continental seas. This scientific evidence suggests there were no "shallow lakes" within the early emerging oceanic basins, on the contrary, the emerging basins were deep, with strong currents, physical environments that don't match Guilherme Estrella's description of shallow lakes. Florian, also, your observation seemingly propagates the notion that this layer of salt up to 16,000 feet below the sea bed several thousand kilometers thick was the result of evaporation as opposed to supercritial water theory. How would you suggest this area was exposed to evaporation as well as the numerous other sub-sea floor salt structures around the world? These salt structures are found all oceanic basins as well as the Mediterranean Sea. Frankly, if there was evaporation as your objection implies it would totally invalidate Expanding Earth theory, as the theory calls for much higher sea levels. Anaconda wrote: The Western Interior Seaway which was mentioned earlier, is also called the Cretaceous Seaway, forming a sea that rose and fell over the course of the Cretaceous Period. The sea at its deepest was roughly 2,700 feet deep, shallow as seas go, but gives the reader an idea of how much higher the sea level was in this period. Be careful, the amount of water at Earth's surface is not constant over time. The amount of water depends on the volume released from the mantle. And that amount varies along the activity (growth) of the planet. Anaconda wrote: The "fossil" theory of oil origin claims that organic detritus precipitates in shallow, and I might add, stagnant lakes, but here the evidence is that it would not be a lake but an emerging oceanic basin likely with strong currents. An emerging oceanic basin always start as a rift system. The lakes form at the rifting stage during early subsidence, then they merge into a seaway, then enlarge to form an ocean. Fossil oil could form at the early stage. Anaconda wrote: The scientific evidence suggests that the rifting of the continents apart from each other created the oceanic basins into which the sea water flowed, thus drawing off the water from the mid-continental seas. Don't forget that at the early stages of the ocean formations, the basins are very narrow, easily filled with sediments from the uplifted flank of the rift. Anaconda wrote: Florian, also, your observation seemingly propagates the notion that this layer of salt up to 16,000 feet below the sea bed several thousand kilometers thick was the result of evaporation as opposed to supercritial water theory. Actually not. Both are possible. it really depends on the amount of water present at the surface at the time of formation of the layer of salt. So again, that is not a clinching argument. I remind you that we mostly agree: oil is likely not from fossil origin nor are thick salt layers "evaporites". Just playing the devil's advocate here. Anaconda wrote: Frankly, if there was evaporation as your objection implies it would totally invalidate Expanding Earth theory, as the theory calls for much higher sea levels. Hell no. The theory predicts fluctuating surface amounts/level, and in any case, a lesser amount of water than present. Look at Mars. There used to be water at the surface, but it is all gone by now (with residual evaporites), because Mars is not very active. But massive amount of water could be released and could flood the surface if Mars somehow regains activity. Note that Enceladus, a tiny moon about 250 km in radius, is very active and is spewing a lot of water through its ridge system.